I was one of those people who for years didn’t buy the idea homemade tomato sauce was better than jarred or canned sauce. We’re talking about a few years back–before people started treating food as religion and it really did seem a bit much to spend a day making sauce. Then I had a sauce that blew my mind and I joined the club. I should begin by saying I never made this sauce until I started working from home. To do it well you need everything to simmer for at least four hours–preferably more like twelve so… when I was working onsite and the only option was the weekend and I’d been cooped up in an office five days a week I was loathe to spend another day inside for the sake of tasty sauce… Working from home, I can rise early, get it all on the stove before my workday begins and let it simmer in the background. I can work from the kitchen table and really keep an eye on it. But, you know, even if you do need to give up a day, if you have the room in your freezer, you can make enough for months, so it’s not that big a sacrifice. Pick a rainy day. Do it while you’re watching that show. You know the one. Better yet, do it while you revisit a season of the Sopranos and the late James Galdolfini. Two Italian greats rolled into one day. So, going back to the revelation. Just because I’d tasted something life changing didn’t mean I was set. I needed a recipe, and if you think the person who introduced me to the sauce gave it to me, guess again. This is a practice I don’t believe in–keeping things within the family. If you have something great, share it. What’s the worst that can happen? I think the average person entertains perverse fantasies that the person to whom they give Grandma’s secret recipe is going to sell it. Make millions from it. Probably not. And who’s to say the recipe wasn’t pilfered in the first place. Maybe Grandma snagged it from her best friend Joe. When I was researching my Mother’s potato salad recipe I found out it didn’t originate with her but with some guy who knew one of the cousins way back when, or something like that. They’re just ingredients, and if put together a certain way they make magic, why wouldn’t you want to spread that around. 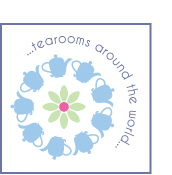 OK, off the soapbox and into the pot! I love Lidia Bastianich, so there’s a little bit of her in here. Ditto Rose Pistola. Then there’s personal taste and common sense. You need olive oil, enough for sauteeing the onions and other bits at the beginning. Make sure your garlic is fresh and your vegetables flavorful–please don’t put a cardboard carrot in there, it adds nothing. You need tomatoes. 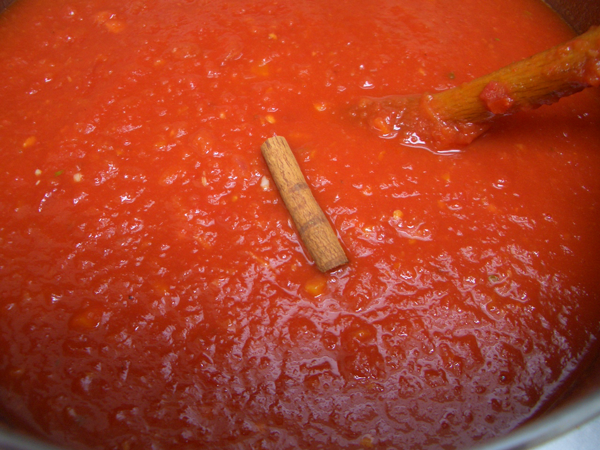 Most people use canned San Marzano tomatoes. 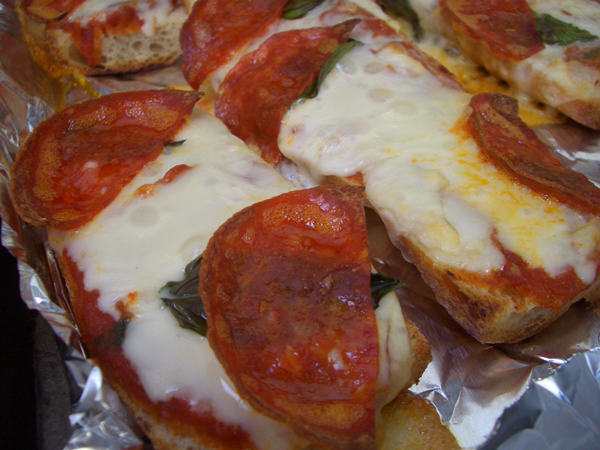 I’ve been experimenting… I have had very good results with Bionaturae and Muir Glen tomatoes. I have also tried Trader Joe’s 99 cent tomatoes. Those didn’t make great sauce. I had to add a gastrique which is a cheat, and we’ll get to that later. Ideally you want to use dense plum variety tomatoes, not gelatinous salad type tomatoes, and you want them to be as flavorful as possible. If you go with San Marzano tomatoes you will always be set for success. Keep in mind San Marzano is a type of tomato and a place in Italy. Take a close look at the can and make sure it says they are the correct type, not simply tomatoes grown in San Marzano. I used to start with whole tomatoes and break them down in a food mill, then I started buying them crushed. The latter is easier though I’m sure some will say you might be getting a few substandard tomatoes in the bargain. You can also break them down in the food processor. You may or may not need herbs. I know it sounds nuts to leave herbs out of an Italian sauce, but some people don’t like them. I think you have to have parsley. Basil is nice. Oregano is something I love but some find it too medicinal. Ditto marjoram. Add them towards the end to keep the flavors from fading. I use an 8 quart stock pot. You want something with room between the sauce and the rim–dance too close to the edge and you’ll get sauce everywhere every time you stir. The main thing to remember with this recipe is you want to stay close by, stirring everything regularly, otherwise the sauce will stick to the bottom and burn. 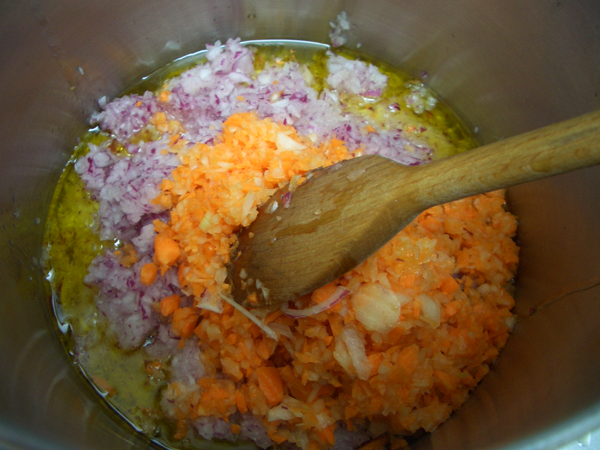 Start with the onions and carrots in room temperature oil and bring it up to medium heat. Cook, stirring often, until all the liquid is gone, 30-40 minutes. The next step is adding all the little bits that add layers of flavor. I may say cook the garlic for 1 minute, but cook it until you smell it and move on before it starts to burn. Cook the tomato paste until you feel it has all touched the bottom of the pan and started to caramelize. Add the red pepper flakes and cook for 1 minute. 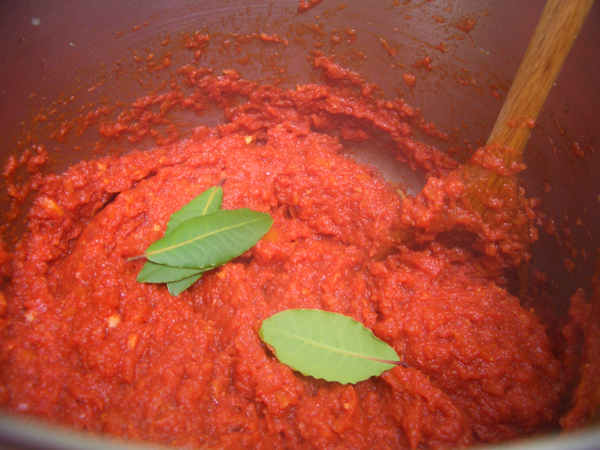 Add the bay leaves and tomato paste and cook for 3 minutes. Add the crushed tomatoes. 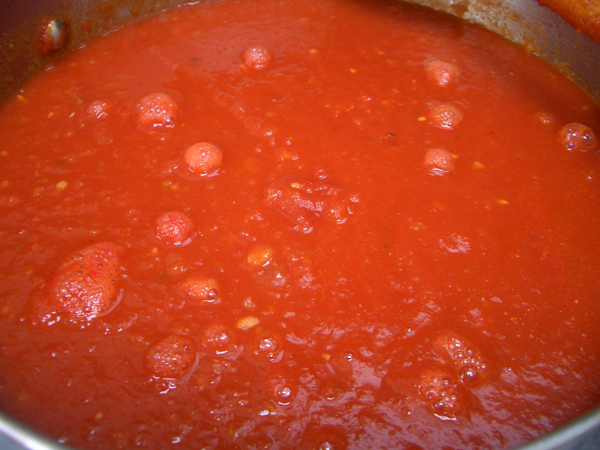 Add a little broth to each of the cans and swirl to get any tomato residue out and into the pot. No waste! Add 8 cups of broth or water and give everything a thorough stir. …and a much larger froth at about 15 which is a good time to stir. When you stir, make sure to scrape the bottom of the pot lifting any bits that might be settling in to burn. As the sauce simmers and evaporates it will get very thick. When you feel like it has reached that point add more broth/water by the cup, stopping when you can stir it easily. How many times you do this depends on how long you cook the sauce. If you cook it for 4 hours you’ll probably only need to do it once; cook it all day, you’ll probably do it 3 or 4 times. Taste the sauce every hour. When it reaches the flavor and density you like, you’re done. Fish the bay leaves and cinnamon stick out of the pot. Add your chopped herbs and let the sauce simmer for fifteen minutes. Ok, now you’re really done. 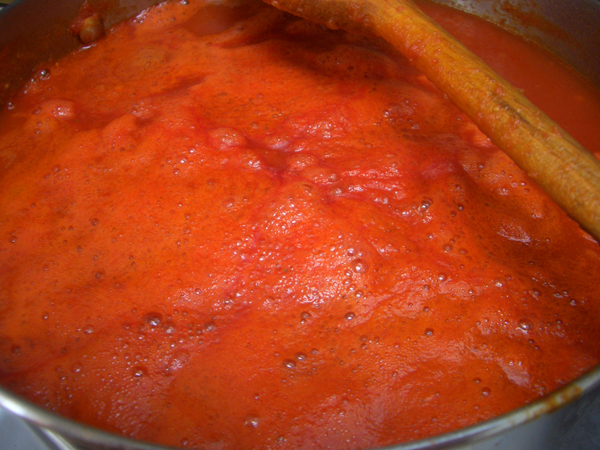 A gastrique is something added to enhance the flavor of sauces. Cook the vinegar and sugar over medium heat until it reduces to the thick consistency of syrup. Add it to your sauce. I store the sauce in quart and pint size containers in the freezer. 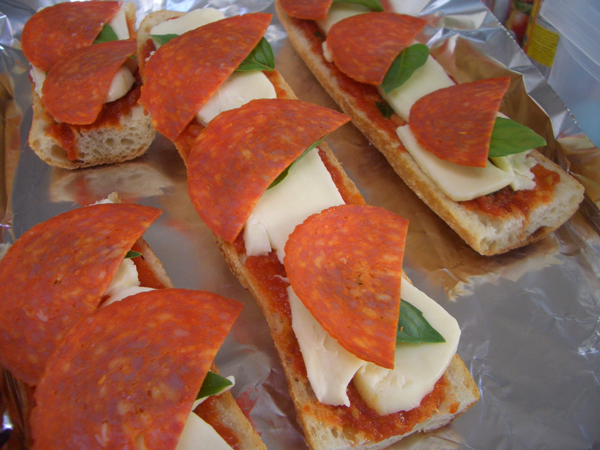 I also freeze the sauce in ice cube trays which gives me just the right amount for small pizzas or pasta for one. Other toppings: pepperoni, salami, mushrooms, peppers, etc. Preheat the oven to 450F/230C degrees. Cover a baking sheet with lightly oiled foil. If you don’t oil the foil and the cheese runs you’ll have a hard time prying them off the foil. 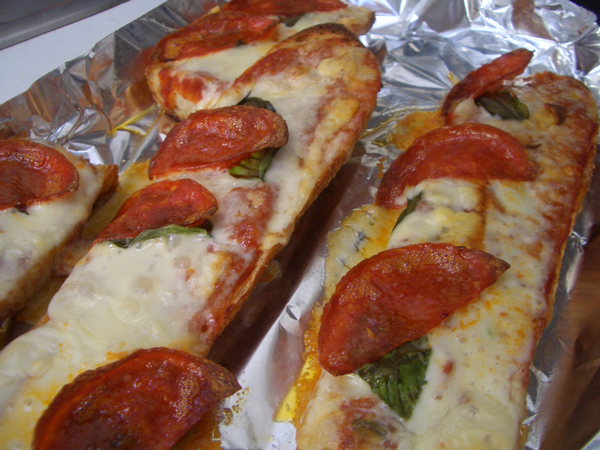 Bake the pizzas on the middle rack for 10 minutes or until slightly golden and bubbly. Serve immediately.